Prensa 30T, the new standard in bench-top presses from Mikron Digital Instruments, creates the highest-quality pellets on the market in less than 60 seconds. 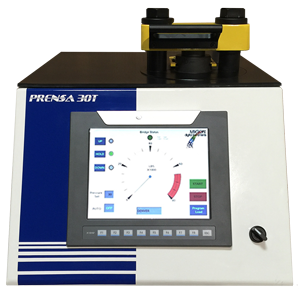 The Prensa 30T is the fastest, most reliable, and easiest-to-operate pellet press ever built. The hybrid swinging bridge bench-top press is the most efficient design yet conceived in an automatic pellet press. Give credit to the old timers; they had the best idea first with the swinging bridge. It took Mikron Digital Instruments to bring it to the 21st-century bench-top pellet press. The new system is Meridian’s Monarch Ultra High Definition (UHD) Universal Digital Imager (UDI) with Wireless Detector with Automatic Exposure Detection (AED). On February 2, 2015, the FDA announced that it had given Meridian clearance to market Monarch UHD for both pediatric and adult radiographic imaging. The extensive approval process included the Monarch UDI 2 and the Monarch UDI 2 with wireless/AED. Mikron Digital Imaging-Midwest has been a Master Distributor for Meridian products since July 2012, including all products that bear the Meridian name. At the time the agreement was concluded, Meridian President Larry Cornell noted that the agreement would free Meridian to focus on design and development of Digital Radiology solutions that are needed in the market. “This focus will lead to faster development and implementation of products and services.” Meridian’s Monarch UHD is one result of that agreement. According to Harvey, the developmental process for digital x-ray is now in its fourth generation. First there were x-ray and film systems. We called this “analog” equipment because it was purely film- and chemistry-based. Second there were analog x-ray machines with the addition of the first type of “digital” imaging called “computer radiography,” or CR for short. It was still two separate systems, though, with each system produced by a different manufacturer. Third there was “digital radiography,” or DR for short, where the x-ray manufacturers built digital x-ray detectors right into the x-ray system. This ‘integrated DR” provided a level of direct communication between the DR and the generator system. And now, he says, “the paradigm has come full circle.” As a fourth-generation system, the Monarch UHD 4K tablet-based DR can be purchased separately from the analog x-ray system while still providing the integrated communication that was provided by the single manufacturer integrated DR system. Simply use it with any analog mobile x-ray system or Radiographic/RF room and that system becomes digital immediately anytime anywhere there is an x-ray source, including in the original room, on a portable x-ray machine, in a Rad/Fluoro room, with a mobile in the OR, or for imaging premature infants in the NICU. If the DR Detector or computer system becomes outdated, the prices of DR equipment are only coming down. Currently with manufacturers’ integrated systems, you have to replace the entire system, including components that are perfectly fine and would have lasted many years longer. Monarch UHD’s software is approved to operate as a certified component when used with the Meridian Operators Console to control the x-ray generator and other acquisition and display parameters. The Monarch UHD is used with a 20″ (4K) acquisition console that features 3840 x 2560 display resolution (9.8mp), four times that of typical acquisition stations, creating images at resolution typically seen only on high-resolution diagnostic workstations. Its advanced software displays those images twice as fast as most other workstations. It is primarily noted for its advanced workflow features, mobility, image quality, and reliability. Monarch’s Imaging panels feature “Quad Cell Technology,” which includes direct CsI vapor deposit to increase both contrast and resolution, a reflective layer coating on the backside of the CsI that increases sensitivity by 1.8 times, and moisture-proof sealing for reliability and long life, all at the lowest dose possible. Meridian’s “Surefire” automatic exposure detection (AED) senses the x-ray and automatically acquires the image without requiring a wired connection to the generator, enabling the Monarch UHD to be used on any new or existing x-ray-capable system. The water-resistant design of the 20″ mobile tablet “operators’ console” enables it to withstand the near-constant wipe downs required to maintain infection control compliance. One advantage of the new technology is lower price. According to Harvey, integrated (dual-panel) DR systems cost about $250K-$325K—single-panel systems are in the $175K-$200K price range; while typical analog x-ray systems cost roughly $85-90K. Meridian Monarch single-panel DR systems cost about $60K-$70K. Therefore, a complete x-ray room, with a single DR panel from Meridian, could cost as little as $145K. Analog x-ray equipment can last 15 years or more. Analog x-ray equipment hardly ever fails. Analog x-ray equipment does not typically need a service agreement. Analog x-ray equipment technology never becomes outdated. That’s why our new tablet-based system—with wireless Bluetooth communications (BLUEcom) to over 20 different x-ray generating systems, wireless connection to the x-ray detector and the hospital Picture Archiving and Communications System (PACS), and wireless communication to the Radiology Information System (RIS)—makes Meridian Monarch UHD truly a one-of-a-kind value. Its one-of-a-kind features, and image quality and acquisition speeds will simply blow your socks off. To our knowledge, it is the only true FDA-approved 4K resolution system on the market. Meridian Medical Systems provides digital radiographic solutions to the healthcare industry. The company has developed proprietary universal digital applications designed to supplement or convert installed analog x-ray systems to state-of-the-art digital flat-panel technology. The company also offers a complete digital radiographic and fluoroscopic product line. The company is located in Aurora, Ohio. For more information about Meridian Medical Systems, visit their website at www.meridianmed.net, call 330-995-0371, or email sales@meridianmed.net. Mikron Digital Imaging-Midwest, Inc. is a regional provider of Next Generation-Leading Edge digital technology for the medical imaging community. In addition to Meridian Medical Systems, they are also distributors for Canon, Neusoft, and Riverain ClearView products. They are currently celebrating their 29th year of providing unequaled equipment and service solutions. For more information, contact Mike Harvey, Vice President of Mikron, at (800) 925-3905 or sales@mikrondigital.com; https://mikrondigital.com. Meridian Medical Systems is pleased to announce that it has received FDA clearance to market their new Meridian Monarch Ultra High Definition (UHD) Universal Digital Imager (UDI) with Wireless Detector with Automatic Exposure Detection (AED). According to Meridian President Larry Cornell, the extensive approval process included the Monarch UDI 2 and the Monarch UDI 2 with wireless/AED. The digital system has been cleared to be used for both pediatric and adult radiographic imaging. The FDA’s decision was announced February 2, 2015. Meridian’s Monarch UDI 2 with UHD sets the standard for clarity and detailed images, reliable image acquisition, mobility, and ruggedness. The software is specified to operate as a certified component when used with the Meridian Operators Console to control the x-ray generator and other acquisition and display parameters. The Monarch UHD is used with a 20″ (4K) acquisition console that features 3840 x 2560 display resolution (9.8mp), four times that of typical acquisition stations, creating images at resolution typically seen only on high-resolution diagnostic workstations. Its advanced software displays those images twice as fast as most other workstations. It is primarily noted for its advanced workflow features, mobility, image quality, and reliability. Imaging panels feature “Quad Cell Technology,” which includes direct Csl vapor deposit to increase both contrast and resolution, a reflective layer coating that increases sensitivity by 1.8 times, and moisture-proof sealing for reliability and long life, all at the lowest dose possible. Meridian’s “Surefire” automatic exposure detection (AED) senses the x-ray and automatically acquires the image without requiring a wired connection to the generator, enabling the Monarch UHD to be used on any new or existing x-ray capable system. Simply use it with any analog mobile x-ray system or Radiographic/RF room and that system becomes digital immediately anywhere, anytime there is an x-ray source. The waterproof design of the 20″ mobile tablet “operators’ console” enables it to withstand the near-constant wipe downs required to maintain 100% sanitation compliance. The Meridian Monarch UHD is one of a number of FDA 510k-cleared products in Meridian’s portfolio. According to Cornell, each submission improved system functionality and performance. This system has been designed to meet or exceed the recommendations of the ACR, the AHRA, the Alliance for Radiation Safety in Pediatric Imaging (ARSPI), and Alliance for Radiology Safety in Adult Imaging (ARSAI). Meridian supports and abides by “Image Gently” and “Image Wisely” recommendations of both the ARSPI and ARSAI. What does FDA clearance mean for Meridian Medical Systems users? In today’s increasing service-driven economy a medical organization’s greatest asset—and cost—is in its workforce and their time. Optimizing this time is at the heart of a medical imaging center’s strategy. With an ever-increasing number of x-ray exams that require mobility, the Meridian Monarch Digital Acquisition System is used to acquire images from any location, on any radiographic unit (analog or digital), and instantly send the images to the radiology review station or PACS. The greatest value of the Meridian Monarch is the gift of time—both for the technologist productivity and the commitment to the best patient care available. Mikron Digital Imaging and Mikron Digital Instruments have combined online presences as a singular MikronDigital.com. As if a good-quality investment wasn’t enough, there is also timing. Mikron Digital Imaging-Midwest, Inc. congratulates Rush-Copley Medical Center, in Aurora, Illinois, for its impeccable timing in being the 1000th purchaser worldwide of Shimadzu’s MobileDaRt Evolution. They made the purchase from Mikron Digital along with an optional second display monitor for use in operating rooms. It was the third MobileDaRt Rush-Copley has purchased. Mikron Digital Imaging-Midwest is a Midwest distributor of Shimadzu products. Tom Kloetzly, Shimadzu’s vice president of sales, made the announcement at the American Hospital Radiology Administrators conference, which was held August 13-16, 2012 in Orlando, Florida. AHRA, the Association for Medical Imaging Management, is the professional organization representing management at all levels of hospital imaging departments, freestanding imaging centers, and group practices. In making the announcement, Kletzky presented plaques for Mikron Digital and Rush-Copley to Robert O’Brien, Mikron Digital account manager. O’Brien presented Rush-Copley’s plaque to Thomas Markuszewski, director of imaging services, during a special visit to Aurora. To Markuszewski, the news, not surprisingly, was a complete surprise. “It was the last thing we expected,” he said. The Shimadzu MobileDaRt is a digital mobile X-ray system that allows verification of images just three seconds after they are obtained, eliminating the need to replace cassettes and read CR barcodes. Its exclusive “Inch-Mover” allows moving forward or backward for fine positioning with bedside drive controls located on the front of the collimator. With its outstanding operability combined with its easy positioning in restrictive locations, the system provides powerful support in medical facilities with a high number of emergency cases. The wireless flat 11″ x 14″ Canon panel integrated into the 32 kW x-ray system provides rapid-speed x-rays that produce clear images even with the most restless of children, and at a lower dose, which makes it ideal for pediatric care. Rush-Copley Medical Center in Aurora, IL, is a 210-bed hospital providing health and wellness services to the greater Fox Valley community. Nearly 500 physicians and 2,000 clinical and professional staff members provide advanced medicine and extraordinary care to patients. Rush-Copley is a member of the Rush-System for Health. Mikron Digital Imaging-Midwest, Inc. is a regional provider of Next Generation-Leading Edge digital technology for the medical imaging community. In addition to Shimadzu, they are distributors for Meridian Medical Systems, Canon, and Riverain ClearView products. They are currently celebrating their 26th year of providing unequaled equipment and service solutions. For more information, contact Donald Dotson, President of Mikron, at (800) 925-3905 or sales@mikrondigital.com; https://mikrondigital.com. As University of Chicago Medicine prepares for the grand opening next year of its cutting-edge Center for Care and Discovery, Mikron Digital Imaging-Midwest is pleased to have supplied four Shimadzu MobileDaRt Evolution units for the occasion, and three more to be used throughout the University of Chicago Medicine’s Medical campus. According to Robert O’Brien, account manager for Mikron Digital, the first six units were purchased this past July 17. The first unit was delivered one month later, on August 15; installation was completed on September 10 in the radiology department. Two others were shipped in October, also for Mitchell Hospital. They will be used in the operating and recovery rooms. The new units replace old portable analog and portable CR systems, including some that are over ten years old. The final three from the first order will be shipped at the end of December and will be installed in the new Center for Care and Discovery. A seventh unit was purchased in October and will be used in the Comer Children Hospital’s Emergency Department. An up-to-date operating system (Windows 7) and choice to use multiple types of wireless cards for integration into our facility wireless network. Bernard A. Mitchell Hospital is University of Chicago Medicine’s primary adult inpatient facility with over 500 beds. It includes the emergency department and the Arthur Rubloff Intensive Care Tower, which houses the burn and electrical trauma units and intensive care units for transplantation, neurology and neurosurgery, cardiothoracic care, general surgery, and general medicine patients. The new Center for Care and Discovery is a $700 million, 1.2 million square foot, 10-story “hospital for the future” that will serve as the new core of the campus of the University of Chicago Medicine. When it opens in February 2013, it will contain 240 single-occupancy inpatient rooms and 28 operating rooms with integrated diagnostic and interventional platforms for specialty care, with a focus on cancer, gastrointestinal disease, neuroscience, advanced surgeryandhigh-technology medical imaging. Also part of University of Chicago Medicine are Comer Children’s Hospital and Duchossois Center for Advanced Medicine (DCAM). Comer Children’s Hospital is a 155-bed pediatric Level-I trauma center that opened in 2004. It annually admits about 5,000 patients from Chicago and around the world, including about 400 children with severe injuries for emergency trauma care. DCAM is a state-of-the-art ambulatory-care facility that offers preventive, diagnostic, and treatment functions in a six-story, 525,000 square-foot building. It is an OP hospital with specialty clinics, imaging, OP surgery, a cancer center, and more.